The ANIMATE modules helps you inject life into your mixes in a precise, versatile and colourful way. Each module with its individual frequency assignments and mid/side functionality you’ll get your music jumping out of the speakers precisely how you want. The Punch module enhances the transients of your audio. Whether you want to subtly accentuate the high-frequency transients in the mid-channel of your master or bring out serious smack on an individual channel, Punch can handle the task. The ANIMATE modules are designed to be your secret weapon in a wide range of mixing and mastering scenarios. Their sonic versatility and precision will help you get your sound jumping out of the speakers exactly how you want. The ANIMATE filter allows you to isolate which frequencies are processed. The frequencies of the signal will glow giving you a better idea of where to set the bands. The filters have a 24dB/octave slope and are combined with an innovative solution to dramatically minimise phase distortion. 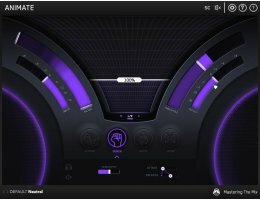 The effects in ANIMATE will most likely increase the volume of your audio. The output slider has a level matching pointer to help you adjust the output gain to match the original perceived loudness of your audio before it passed through ANIMATE’s effects. When you bypass ANIMATE you can confidently determine whether your settings have a positive or negative impact on your sound. Mid / Side, Left & Right functionality. Easy to set up. Gives you total control with a user friendly interface. Interactive tool tips can be activated in settings for more information.